David: We had met twice in a way. The first time was in 2003 in my mother's kitchen. My sister Anja brought with her her best friend and we two stood and talked a little too long to be solely polite. We have had time to celebrate Christmas a number of times, Karin's mother lives nearby so she usually visited and played games after the Christmas celebration. The second time we met was during Christmas of 2015. Karin was upset in my mother's couch because her ride down to Stockholm had canceled and she really had to go. To be kind and because it is fun to drive, I offered to drive her and my sister Anja. I thought it would be a nice road trip. Once there, Karin felt it would be sad to be without company. So we decided to stay one night. We bought pizza and went home to Karin and watched a movie. I have always kind of liked Karin. But I may have been more enthusiastic about her coming over and playing games for Christmas than I have shown. And maybe more disappointed when she canceled. I was still both surprised and happy when her hand found mine in the sofa while we were watching the movie. Me and my sister went home well without even discussing the event. I send a text message to Karin that "That was nice and I will miss it". Well at home we wrote to each other in general without me saying anything about any butterflies in the stomach. I asked if it is possible for us to call instead, officially because my fingers were tired of all the texting. Three days went by and I heard nothing. On New Year's Eve, I send a text message to Karin - "I'm fond of you". There are five hours of complete radio silence. Then I get a message that said: "it's a bad idea". I do my best to hide how sad I got. We continued to write a little bit forward and back on how new year progresses. When I again asked about a phone call, I got the answer that "if you are awake when I get home then maybe we can talk. It ended up with me sitting awake from half past two to half past five in the morning before she calls. We talked until about ten in the morning. A few days later I am back in Stockholm, without my sister. Karin still thinks everything is a very bad idea. We ate Indian food. I slept over. I started to take shuttle services between the cities of Ljusdal and Stockholm. Karin says that "if you demand that I decide about all of this now, I will say no". I am preparing for months of uncertainty. But as early as April, I am awakened by my sister talking to Karin on the phone. "Karin has passed the point of no return, now you can tell Mom". I didn’t understand anything at that point, other than it was a positive thing. 4 months later I moved to Stockholm and Karin handed over a ring and asked if I wanted to marry her. Karin: Already when David put up on Facebook that were engaged, my friend Matilda commented: "I want to make the dress"! Now, this friend happens to work with this and be incredibly skilled, so I didn't say no. For me, a white dress wasn’t what I wanted. I thought it was much nice and more special to have a gray one. I knew I wanted a two part bridal wear, a skirt with high waist that would and a shorter top. Matilda knows me very well, so she also knew what I meant when I explained. At first, I only wanted the upper part to be in lace, but Matilda persuaded me to wear both part in lace and I am very happy for listening to her. Then there is also a lot of tulle under the skirt, it was heavy and absolutely fantastic to wear. I am incredibly pleased with the dress and I think it is the most beautiful dress I have seen. David bought his suit, and brought my little sister Hanna (who for several years worked on selling suits ) for advice. They went around with fabric samples from my dress and tried to find something that matched, and the choice fell on Tiger of Sweden. David had a gray shirt in the same color as my dress. He chose to have a dark blue jacket with gray pants, so it would feel a little more relaxed. The bow tie was chosen to match the jacket. Karin: We live in Stockholm, but since we are both from Hälsingland and it is beautiful there, it felt like the perfect place for our wedding. 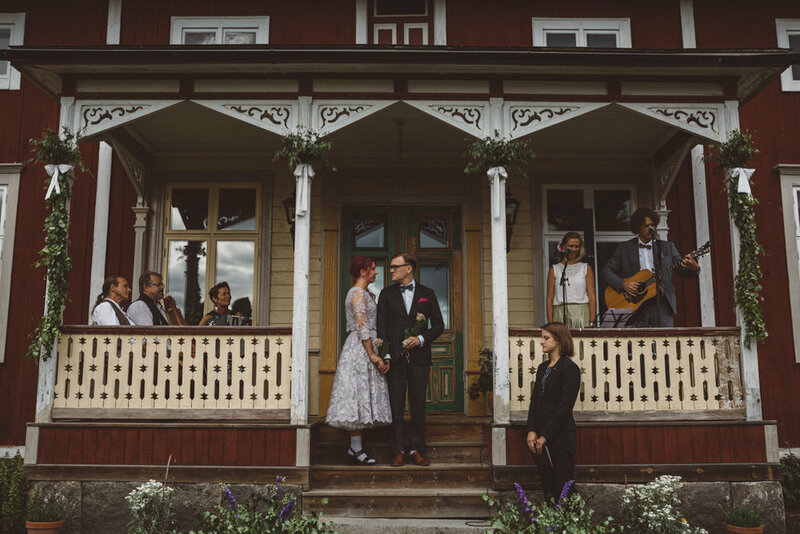 We were looking for several venues in northern Hälsingland, mostly rural farms. When we were looking at Delsbo's village, it felt like an obvious choice; the room where we intended to have dinner was big enough, they had a good kitchen, chairs, tables, porcelain and other things included in the rent. Then it was a bit of a challenge to fix the actual room, but we had a lot of help from friends and family members in order to put everything in order. Two of my friends sewed about 200 pennants, and my big sister who works with catering was in charge of the table setting. David's friend Teresa lives pretty close to the village and has a nice little Hälsinge farm, so we had the wedding ceremony on her yard. Teresa and her parents had decorated very nicely. Karin: We had honestly no idea on how a wedding "should" or "usually" is arranged, but we planned with the goal that it would be this year's party. 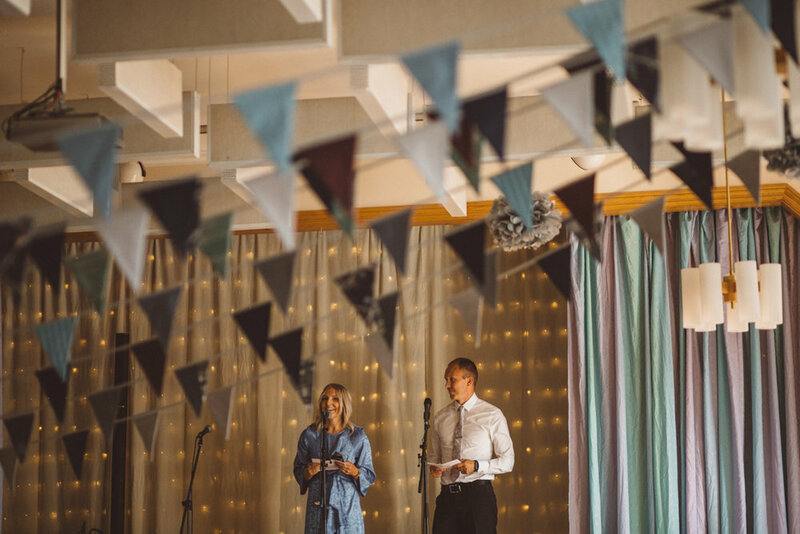 We were not so interested in the fact that it would be traditional or formal, and during the planning we were told from several places that this wedding was very "alternative". This was nothing we really wanted. We just tried to do it our way. Both me and David wanted two rings each, we both wanted to look nice and it was obvious to get ready together in the morning. We also had no bridesmaids, but my sister Hanna joined us on the wedding ceremony and held the rings. It was important for us to invite everyone we wanted to invite, so we tried to find different ways to keep the costs down so we could invite many guests. Both me and David like to have big parties, so to invite many guests felt obvious. When we wrote down a first sketch on the guest list we came up with 250 people, but in the end it became about 120 guests. Hälsingland was also a general inspiration for us, we are very pleased that we get two Hälsingland farms and a village house for two days of celebration. We tried to get away from a formal feeling, but at the same time we didn't want it careless. It was also very important that the atmosphere was relaxed and fun, that we and the guests would have fun. We had no dress code, we just wrote on the website that people should wear the clothes they felt good in. David: The starting point for our accessories was that it would feel party and glam, that Karin's dress was gray and that her hair was pink. The party generally went in blue and gray. So we both bought a pair of silver socks. I found cufflinks that resemble small disco balls. My sister manages to find a handkerchief that matched Karin's hair color. My friend Hanna, who’s a hairdresser, came by and fixed our hair in the morning. We wanted simple but neat hairstyles where we still looked like ourselves. Karin did her own makeup and her sister made mine. 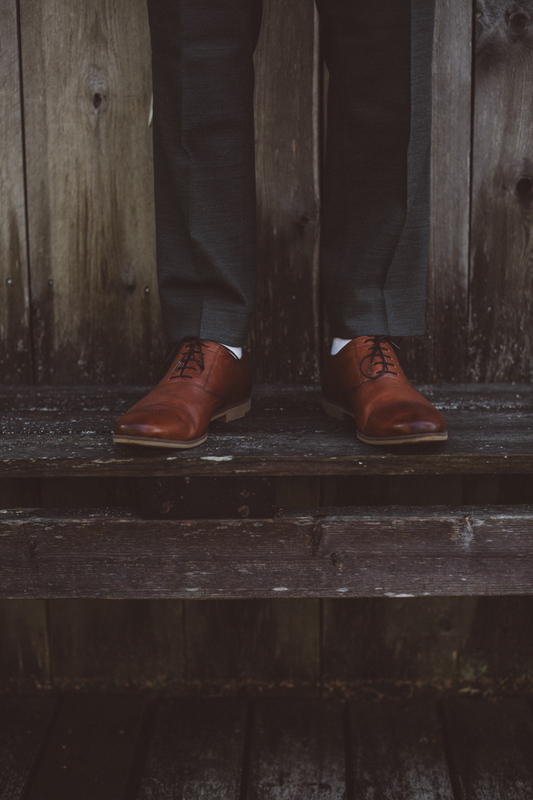 I had a pair of bright, low leather shoes, Karin had a pair of high heels from & Other Stories on the wedding ceremony and dinner, and a couple of low, white shoes at the party. Karin: Before I proposed to David, I was looking for rings that did not feel too generic. I'd rather not have any diamonds, but I wanted the rings to still feel unique. I found Elindesign in Gothenburg, and she sent up a silver ring that was about the model I was thinking of that I was pleased with. Then when David said "yes!" we went down to Gothenburg, and she made engagement rings in palladium according to our wishes. Before the wedding we went down again and ordered wedding rings in rose gold. David and I have similar rings. The rings and the photographer were our two biggest expenses, which we will have left for the rest of our lives. Karin: I work as a film photographer myself, and did have some requirements for which photographer we should have. 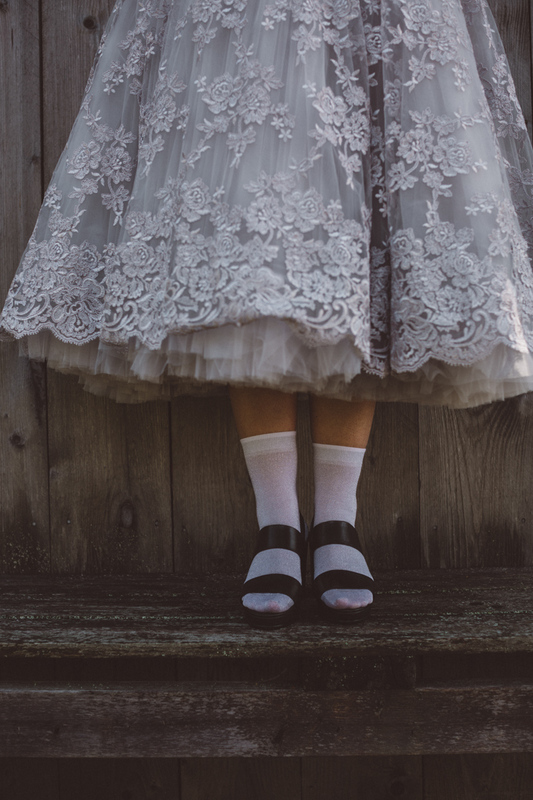 A wedding is just one day that goes by very fast, but we will be able to look at the photographs over and over again during the rest of our lives. 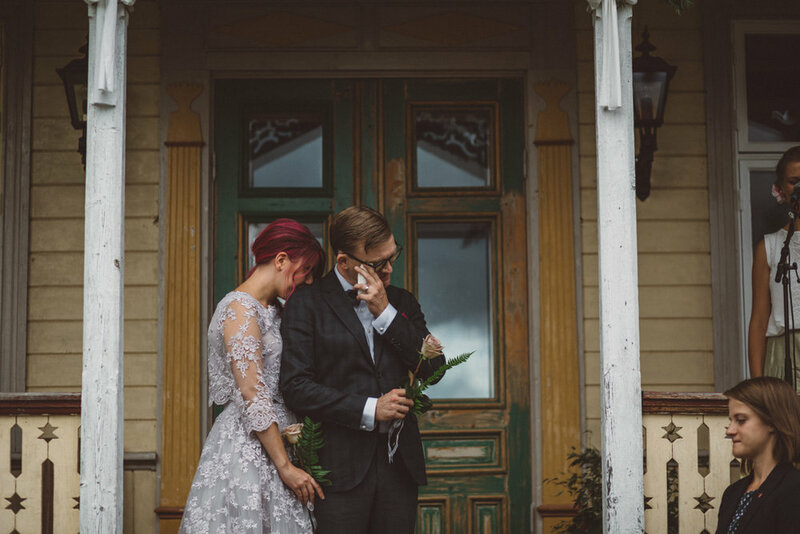 For me it was important that we had a photographer who caught the feeling that existed during the day, and how we and the guests actually looks like. I wanted to recognize us and the day in the pictures. I find it very difficult for rigid wedding pictures in light backlight. Once I started looking for a photographer, I noticed first of all that it was not so easy to find someone whose portfolio I thought was in line with what I was looking for, and secondly, the ones I found was already booked. Then I found Amanda Falkman's website, and was completely sold. And she was available on our date! David hadn’t though so much of a photographer before, and I had to persuade him that it was worth the money. Then when we met Amanda in Stockholm a few months before the wedding we both fell in love with her, and the pictures are absolutely fantastic! It really feels like being back at the wedding when we look at them. Each image is so nice that it could be framed. I also do not understand how Amanda managed to slide around with two big cameras in the small bedroom where we were getting ready in without even being noticed. The same on the wedding ceremony, although it was very short, she managed to get everything from several angles. The pictures are so well-composed that it is hard to believe that they are not set up, Amanda just went around us and we didn't even notice when she took most of the pictures. We both agree that it was the best investment we made, to hire Amanda. David: We knew early on that we didn't want a church wedding. However, we wanted it to be serious. When we looked at inspirational images, we got stuck for easier weddings out in the wild. Actually, you gather together in a nice place that you have decorated and have a shorter ceremony. However, it can be impractical to transport guests out into the forest and back. A good tip we got from our photographer was to have a complete mobile ban during the wedding ceremony. Partly because we actually had our own photographer but also because we would not have to see a lot of phones instead of faces when we looked out over the guests. It is something that we really appreciated. 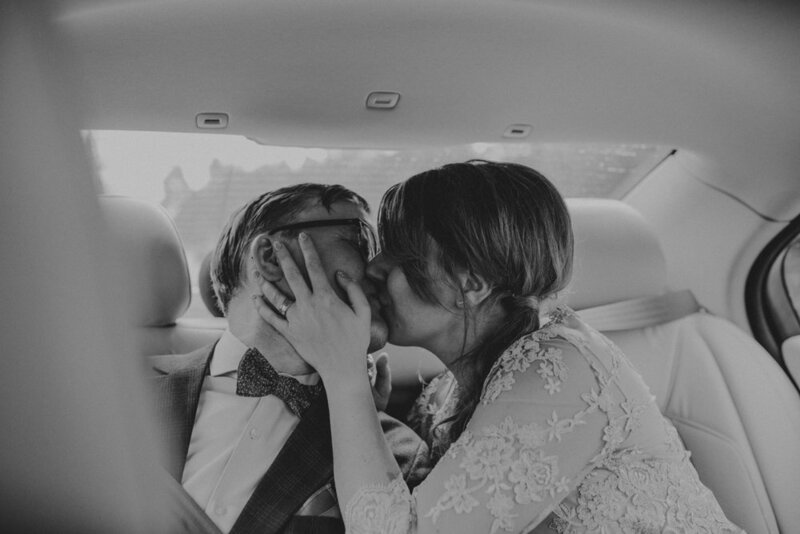 When we got in the car on the way to the ceremony, I felt like riding a roller coaster of emotions. Karin's sister Hanna drove us. She was also a general "wedding general" and was in charge of the rings. When we arrived at the farm where we would be wed, all the guests were already waiting. The gamblers are waiting for us to get out of the car. I am generally not very easy-going but know long before that this will be a crying party. The musicians started playing “Jämtländsk bridal march”, we took each other's hands and started walking. I had a hard time lifting my head up. I occasionally looked up, and it was a strange feeling that your friends from so many different periods in one's life are now in the same place, for our sake. David: We went to the stairs and looked out over all the guests. The ceremony is simple. Our wedding officiant Charliene welcomes everyone. She reads a poem. Our friends Maja and Per sings “Time in a bottle”, a 70's song we heard in X-men and that is very nice. Charliene pronounces us husband and wife. No phones during the wedding, but preferably on other times. Arrange a children's table for dinner, a room with activities and a babysitter so that the children who get bored are not running around at dinner. If you have arranged accommodation for the guests, plan your OSA dates so you can cancel unused rooms. Keep the costs down so you can invite MANY. The more the merrier, really. Invest in the sound. We rented sounds that are otherwise booked by festivals. Ask for help. We could not have done it without help from friends and family. It also kept both costs and stress levels down. Shared documents. We used google docs and dropbox a lot. A good way to avoid, if possible, that only one partner becomes the spider in the web. Arrange with transportation. We found a local cab that was on stand by between 22-02. A Brunch the next day. When we invited so many guests, we knew we would not be able to talk to everyone during the day, so we arranged a brunch the next day for the guests who wanted to. It was like a relaxed gathering, where we were sitting down and talking to those we didn't have time to talk to during the dinner and party. We sat at the head table and had three chairs in front of us where guests could sit down and talk. It was much more relaxed and enjoyable than having to sit with your parents on a row, without seeing any faces. Website with all the information. We wanted to avoid further stress on getting thousands of questions from all guests about everything from addresses to clothing and allergies, so we just wrote down all the information about the date on the invitation, then all guests had to go to the website (which our friend Jesper designed) for all other information. We also had an electronic OSA form there. It made things very easy.